In the office I am currently running through a series of smaller sized motherboards – both micro-ATX and mini-ITX. Due to the size, there is plenty of scope to push towards something niche, something that works, or something that slips comically on a banana by missing the point entirely. 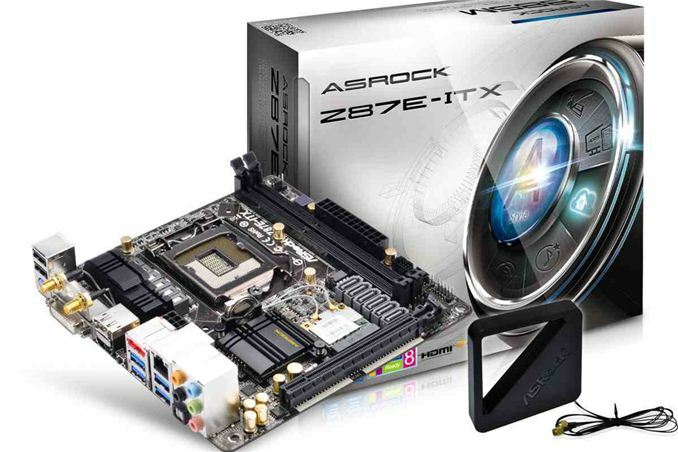 Today we have in the ASRock Z87E-ITX, a $150 $140 motherboard that flew under my radar until it landed on my test bed. The two main focal points for users looking at Haswell mini-ITX platforms are on the higher end: the Z87 Impacts and the Z87 Stinger, both of which will be the focus of future reviews. For that sort of price (>$200), plenty of fully sized ATX motherboards come into the mix, whereas the ASRock Z87E-ITX is currently etailing at $150, and the reduction of the PCB space from a full sized board could offer potential on the functionality front. On first glance, the Z87E-ITX does not strike any visual cues. However, the big feature point for the ASRock Z87E-ITX, apart from the size, is squarely at the use of a Broadcom 2x2:2 802.11ac WiFi module. As far as I can tell, this is the cheapest Intel motherboard on the market that uses an 802.11ac module (there is an AMD A88XN motherboard that is $110), and in our testing we saw a ~430 Mbps throughput at a distance of 6 feet from a DLink router. Alongside the usual, this motherboard has six SATA 6 Gbps from the PCH (capable of RAID 5), a Realtek ALC1150 audio codec (performed well in our test), a TI NE5532 headset amplifier for 600 ohm support, six USB 3.0 ports (four on the rear, two via a header) and an eSATA. Perhaps a little on the downside, like most mini-ITX motherboards, we only have two fan headers, the CPU power connector is an awkward place and the SATA ports are all bunched together to make locked SATA cables a pain to remove. The board is a six power phase design, and by virtue of the price we do not get the 60A chokes of more expensive models – nevertheless overclocking performance was overly positive. I used the word ‘Juxtaposition’ in the title of this review, and it is often a word misunderstood. It applies to the Z87E-ITX in several ways. For CPU performance, the motherboard does not use MultiCore Turbo to pump the multiplier up in max load (there is an option in BIOS, but it is not enabled by default). As a result, multithreaded CPU benchmarks are behind most regular Z87 motherboards: but chances are a mini-ITX motherboard is going to go into a cramped environment where extra turbo modes might be detrimental to overheating, so this is not fully a negative. Despite this, and the lack of additional fan headers/USB 3.0 or SATA 6 Gbps controllers, the Z87E-ITX outperforms many of our other motherboards in our gaming tests, if only by small margins. To cap it off, our overclock testing on the Z87E-ITX gave a solid 4.7 GHz under 90ºC during OCCT load, a feat not often seen in our Z87 testing. The 802.11ac performance is quite nice as well. On the software and BIOS side ASRock supply the Z87E-ITX with the usual array. The BIOS is easy to use and well laid out, being one of the best aesthetically pleasing visualizations of a graphical interface this generation, and the software runs through A-Tuning, with XFast RAM, XFast LAN and XFast USB. ASRock have improved fan control over previous generations, along with a push to move most of their apps under a single installation and interface. Overall, users should understand that mini-ITX usually comes with a side of compromise, either in features, functionality or performance. Perhaps all of the above. There are a couple of more pertinent marks against the Z87E-ITX (8-pin CPU power placement, two fan headers) that other motherboards do better, but the Z87E-ITX takes more steps forward than back for a $150 mini-ITX motherboard with 802.11ac WiFi included and should suitably fit into most ITX builds. As always, mini-ITX platforms are to be limited by specifications - the major one being size, where we get a 17cm by 17cm PCB. This puts obvious pressure on the motherboard manufacturer to fit everything on board, including socket, power, DRAM, SATA ports and any manufacturer specific additional components. One thing to notice when looking at the Z87E-ITX is that it is not the prettiest motherboard by any means. Due to the manufacturing process, you will notice that each component has a white box around it to help the machines place components correctly. Some manufacturers have tools that do not require this, or provide a coating on a motherboard to hide it – ASRock tend to leave those options for their high end products. Around the socket area the first thing that draws my attention is the power delivery chokes. 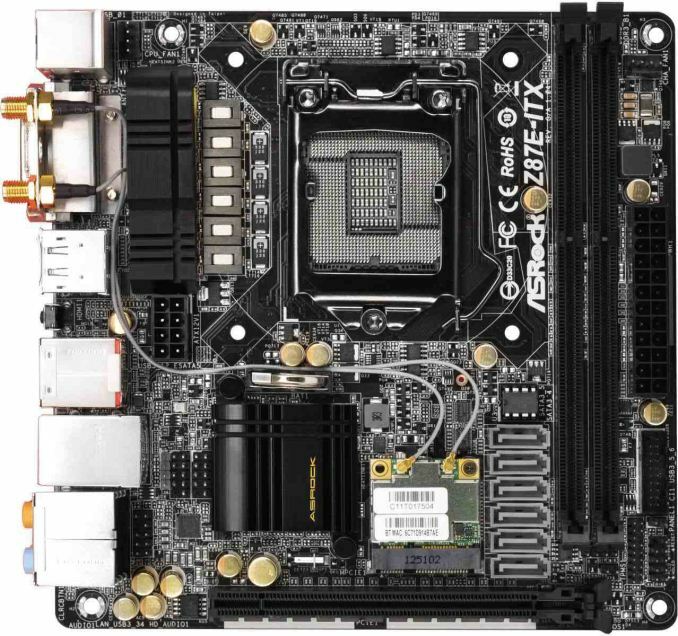 Back when I reviewed the Z77E-ITX, the Ivy Bridge version of this board, I commented that they looked like the standard chokes on low end motherboards. Back then, ASRock commented to me via email that these are Iron Ferrite chokes, ones used for server builds, and thus have the longevity, heat loss and power consumption figures suited for environments that mini-ITX boards might be put in. One big adjustment on the Z87E-ITX over the Z77E-ITX is the socket placement, which has moved up the board nearer the top and out of the way of any large GPUs that might be used. One feature I would like to push on mini-ITX motherboards is more fan headers. ASRock have two on the Z87E-ITX, which is the most common number of fan headers on a board of this size. Some ITX motherboards have more, and I would like more than two for sure. The fan headers on the Z87E-ITX, both four pin, are located at the top of the motherboard – one on the left near the rear IO, and one on the right above the 24-pin ATX power connector. Next to this latter one are the DRAM slots, which use the single sided latch mechanism in order to not interfere with GPUs with large backplates. Make sure your memory is therefore pushed all the way in to be recognized. Underneath the 24-pin ATX power connector is a USB 3.0 header, giving two USB 3.0 ports out of the board’s total of six. Using our Flex IO mathematics (PCIe 2.0 lanes from chipset = 18 - native USB 3.0 - native SATA 6 Gbps), using six USB 3.0 and six SATA 6 Gbps leads to six PCIe 2.0 lanes for the PCH. This is a fairly common arrangement for mini-ITX, given that no PCIe 2.0 x4 slots are required and thus the PCH lanes can be directed to controllers. The Z87E-ITX also has a TPM header on the bottom right of the board. As mentioned, the board has six SATA 6 Gbps ports all native to the PCH, which means that they are capable of RAID 5 for a nice 4/5 slot home storage system (+OS and/or ODD). The downside with these ports is the arrangement – as shown above, it means that when using locking cables, in order to remove the bottom SATA device the others above it also have to be disconnected. Next to the SATA ports is the 802.11ac mini-PCIe WiFi module. This is the same Broadcom IP we have seen in the other ASRock motherboards that use 802.11ac, capable of dual band and BT4.0. The card is connected via two wires to the back plate of the motherboard, where the bundled antenna can be attached. This will annoy some users for sure: ideally the WiFi card should be on the rear IO to begin with as that usually suits everyone. To the left of the chipset heatsink are a pair of USB 2.0 headers and our front panel audio header. This audio header should be at the ‘front’ (near the DRAM) to make it easy to connect, but due to audio codec design we find it instead at the ‘rear’ (next to the rear IO). The Z87E-ITX uses a Realtek ALC1150 audio codec with a TI NE5532 headset amplifier; although due to the board size we do not get any distinct electrical placement separation between digital and analog signals. Above the chipset heatsink is the motherboard battery, sticking out of the motherboard, and above the USB 2.0 headers we have an oddly placed 4-pin CPU power connector. When analyzing mini-ITX motherboards, the placement of the 8-pin CPU power connector is a surefire way to see if a manufacturer has quizzed end users on their preferred placement. My preferred location for this power connector is on the other side of the DRAM slots, next to the 24-pin ATX power connector. I do not want my CPU power cable reaching over the motherboard/DRAM/GPU in order to be connected. Unfortunately, this is what we get here. I can imagine that relocating this nearer the right hand side of the board requires a not-so-insignificant amount of electrical redesign, but I find it to be the preferred place for mini-ITX builds. The rear IO features two USB 2.0 ports, a keyboard PS/2 port, two connectors for the bundled antenna, a DVI-D port, DisplayPort, HDMI, a Clear_CMOS button, an eSATA, four USB 3.0, an Intel I217V NIC and audio jacks from the ALC1150. Also of note on the ASRock Z87E-ITX is the mSATA placement, which following on from the Z77E-ITX is on the rear of the motherboard. When building my father’s mini-ITX system with the Z77E-ITX, I found this the preferred place for his OS drive, such that he would not be able to mess around with it and break it (like he did his previous boot drive SSD). Plus points for the Z87E-ITX are the audio codec being better than almost everything at this price point, along with six SATA 6 Gbps that support RAID 5 and 802.11ac WiFi included. That rear mSATA is nice as well. Downsides start with only two fan headers, 8-pin CPU power connector placement, and a lack of power/reset buttons (two digit debug would have helped as well). ASRock are keen to push their new A-Tuning philosophy, but the Z87E-ITX has missed features like HDMI-IN in exchange for DVI+VGA compatibility. 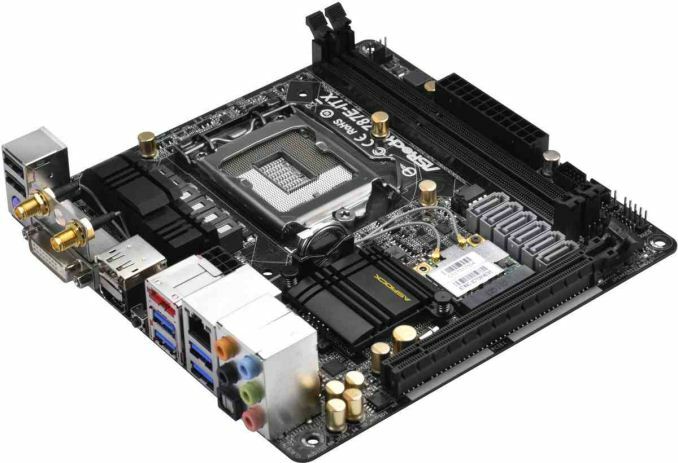 I bought one of these a while ago and it really is a good motherboard. I was having some issues with 1.35V RAM at first, but UEFI version 2.10 cleared that up for me. The Bluetooth part of the 802.11ac/BT module gave me issues as well, but that was all driver-related. Even still, I swapped it out for an Intel part that's performed much better. I have the H87 version of this board, and had the same exact problem with 1.35v RAM until the August BIOS update v1.5. That BIOS also fixed a crazy Windows 8.1 (beta at the time) problem causing the event viewer to log a ton of disk IO errors that were in actuality, inert. So far ASRock support has been exceptional. I'm traditionally an ASUS user (and use an Asus H77 ITX board in my file server with a Areca RAID controller) and the BIOS is nearly identical to ASRock. The ASUS software, however, is slightly more "professional" looking, but the XFAN utility and other tools function virtually the same. They're the same company, after all. "So far ASRock support has been exceptional." The Gigabyte A75 chipset boards have UEFI problems as well, so I think it is more an FM1 chipset problem than a board manufacture problem. But then again, Gigabyte isn't always great with their support either. Do the eSATA ports and mSATA ports take away from the 6 ports on the board, or are they in addition to the 6 ports? Do you have official documentation or something else that backs that up? the user manual will clarify it for you, but the eSATA and mSATA each share a physical SATA port on the board. You are limited to 6 SATA devices. What I've done, is stick a 2 port SATAIII MiniPCI-E HBA into the top-side mPCI-E slot. (I am not using the wi-fi/bluetooth).